The most important part of playing saxophone without a doubt is your embouchure. Without learning how to develop the strength in your mouth properly and combining a good mouthpiece with the right strength reed, you will find it difficult to play saxophone. I once had a teacher that taught me to play the mouthpiece first. I had to be able to play a full octave on the mouthpiece before I was allowed to put it on the saxophone. While this is a bit extreme for most people, it does prove a point. If you learn to control your embouchure first, controlling the horn is made much easier. Working to try to control the two together can be somewhat frustrating. So, the first thing to do is to learn to control the sound you get from your mouthpiece. The best way to do this is not to play a lot of notes, but to play just one, or just a few, one can get a little boring after a while. The idea is to be able to control your tone, trying to keep the note as stable as possible. This will help your mouth gain the strength it needs to play the horn. The next thing to learn is how to use your mouth to create the sound. This is probably the hardest thing to explain, and not just in words but also to show how the mouth should be placed around the mouthpiece. To begin, put the mouthpiece into your mouth about 2/3 to 3/4 of the way in. Blow with a steady stream of air. Picture placing the mouthpiece so that you can feel the breath pass perfectly straight through the mouthpiece. If you make a duck call kind of sound, you have the mouthpiece too far in. If you feel like you are having trouble getting the air through the mouthpiece, the it is too far out. Keep trying until you can get a clean, high pitched tone from the mouthpiece. It is also important to not how you place your lips and teeth. Your top teeth can rest lightly on the top of the mouthpiece and your bottom teeth should be insulated from the reed by folding your bottom lip under. You should not use your teeth to bite down on the reed and mouthpiece. If you feel like you have to do this to get a sound, then you are using too strong reeds. When I first began to play, I was taught to use my teeth to apply pressure on the reed while using my lip to insulate the teeth from the reed. After quite a few years of playing I began to find that this is not a good way to play. I was in an orchestra at the time and we were rehearsing for 3 hours and then playing a concert for 3 hours. This went on for 6 days in a row. After a few days I had began to bite through my lower lip and it became so painful that I was no longer able to properly control my tone. I realized at this point I needed to relearn my embouchure so that I no longer bit through my lower lip. I started to seek out videos and images of all the saxophone greats. To me it appeared that many of the famous white players seemed to have the same issue as me, it appeared they folded their lower lip over their bottom teeth. On the other hand, many of the famous black players kept their lower lip uncurled and rather than using the pressure of the muscles of the lower jaw to push the teeth onto the reed using the lip as an insulator, they held the mouthpiece in their mouth with the pressure of the lips only by curling them out, not in. This is actually much harder than the other way and requires a lot more mouth strength but at no point do you experience the discomfort of biting through your lip, you only get tired muscles at the corner of your mouth. And with practice, even this goes away, allowing for hours, even days of playing without your mouth ever getting too tired. It took me years to unlearn that habit, I recommend you try learning it from the beginning. 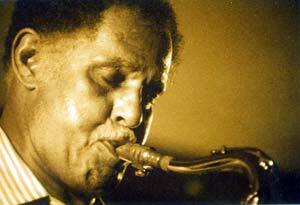 Check out the example of Dexter Gordon and his embouchure in the picture above. This entry was posted on Monday, February 9th, 2009 at 1:24 am	and is filed under Beginner Lessons. You can follow any responses to this entry through the RSS 2.0 feed. Both comments and pings are currently closed.